Make Sugar Cube Sugar Skull Art with Kids! Looking for a fun Day of the Dead Sugar Skull Craft to do with the kids? 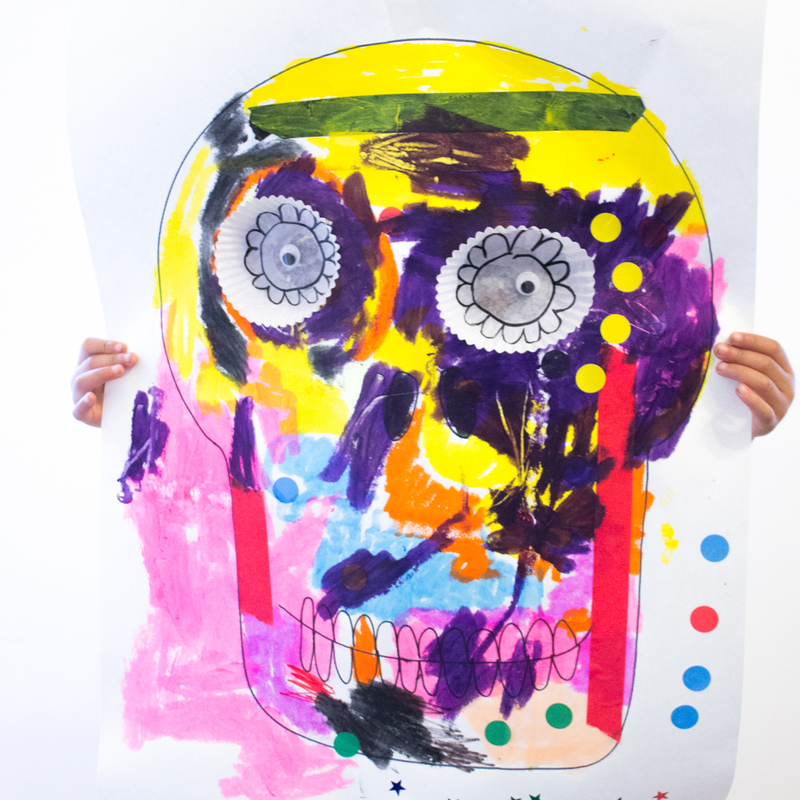 How about this sugar skull process art activity? Different, everyday materials are combined to create a piece of unique and lovely artwork! Alright everyone... the countdown is on. It's just a couple of days till Halloween. Are you excited? Or, are you over all the orange and black? I'm in the first group and still SUPER excited for Halloween. I just finished Chuck's costume this past weekend, so he's ready to go. I'm not sure if he'll appreciate the idea of trick-or-treating (plus his allergies prevent him from eating a lot of the candy out there), but I think he'll enjoy seeing other kids in costumes and all the spooky decorations. I'll upload some photos of his costume later on this week... but today I just wanted to share the last of my sugar skull crafts. So, we already made DIY sugar skull candle holders and DIY sugar skull luminaries and Allison shared her lovely tutorial for DIY sugar skull shoes. Today's sugar skull crafts were designed with kids in mind. They're easy to make and the resulting products look great. Colorful and fun, these two skulls will float happily on your window. Looking for a simple, cheap, and fun way to make masks for Halloween this year? Why not try making some out of tulle and fabric paint? Inspired by these masquerade masks from Sprinkles in Springs, I created my own Day of the Dead Mask for Handmade Charlotte. Check out the tutorial here! Currently my college friend Kim is visiting us for the week. It's been really nice having someone else here while hubby is away. Time just passes by much quicker when you're having fun with a friend. And just how have we been having fun? Well, we've been playing with Chuck... and eating... and watching tv... and crafting... a lot... a whole lot... Halloween and Dia De Los Muertos are right around the corner, so all of our crafts have been centered around those two holidays. I'd seen tons of posts for ghost milk jug luminaries for awhile, so I figured this was a nice twist on that craft. It uses skulls and colorful lights instead of ghost faces and white lights. I just love how this little guy turned out. He's so cute and smiley... and gosh darn it, I've just got a big ol' soft soft for any craft that involves twinkly, colorful lights. Earlier this week I shared that Allison from Dream A Little Bigger and I were doing post swaps. On Monday I visited her blog and showed how I made these cute and colorful perler bead bracelets. Surprise! 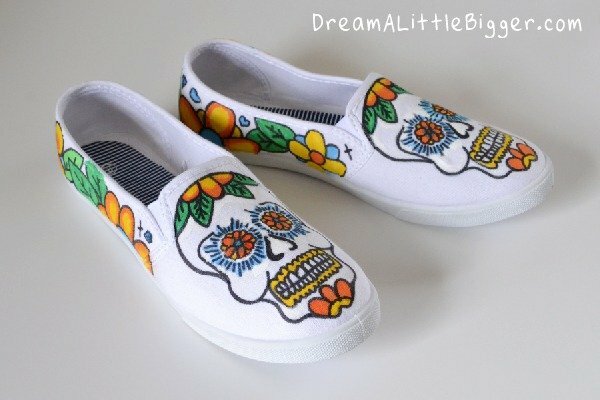 Today Allison's over here, presenting this super cool sugar skull shoe tutorial. With Halloween and Dia de los Muertos coming up, this craft is a great one to do. It'll certainly get you into the spooky spirit!